Eli Wheaton was born in 1869. Eli was a carpenter and obtained the piece of land (which at one time was a daffodil field - possibly of the king Alfred variety) in Newton Poppleford which is now Woodley’s Joinery. He built a 3 bedroomed bungalow of wood and a wooden workshop at the rear. He also kept a large and productive garden adding fruit trees, keeping chickens, ducks and bees. Eli’s business included, Carpenter, Painter and Decorator, Wheelwright and Undertaker. All of his business came from the village and surrounding farms. Eli died in 1939. His daughter Alice had married Jack Woodley in 1930. Jack took the business on as both of Eli’s WW1 surviving sons didn’t want to. 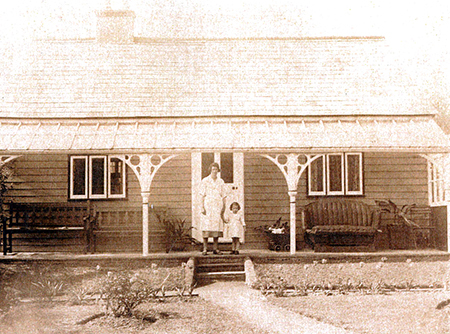 "Alice & Ray in front of the wooden bungalow (circa 1935)"
Alice and Jack moved into the bungalow with Alice’s mother and Jack sold his house and continued his business on in Newton Poppleford. Jack was a self-employed carpenter who had also ventured into house building. He listed his work as Builder, decorator, carpenter and general repairer. In addition listing, all kinds of plumbing a speciality, hot water engineer and all classes of pumps repaired. Electrical engineering was in its infancy then and Jack installed his own generator to light his house and to work the water pump. He also used to charge up customers accumulators, which were required to work the wireless sets that everyone was buying. The business grew and gained employees. Farm wagons and carts were built and repaired and general building repairs and plumbing work took up much of the time. As the war progressed the employees were called up to war service. Only the older men and apprentices under 18 were left. 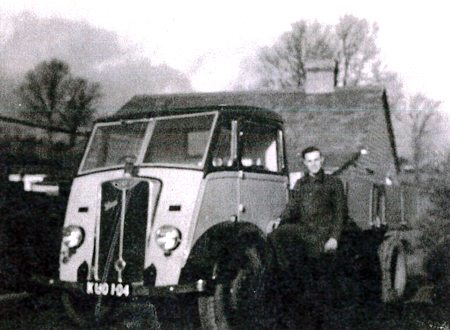 Jack had taken on servicing and looking after the village water supply he was also a fireman and had a small fire pump. In addition he had room in the attic of his workshop to store dried biscuits and food for a village emergency. He was also the village undertaker, as was traditional with small building/joinery company’s employing enough local labour to enable coffin making, transportation, bearing, grave digging & other funeral necessities to be carried out on an as and when required basis – all then returning back to their everyday trade duties within the company. Eli’s wife (Alice’s mother still living with them) had a sister who was married to Tom Burgess. Now Tom had a business in Exeter supplying bee-keeping equipment throughout England. Bees were very important for pollinating our dwindling food supply during the war. Jack with Tom’s help began manufacturing beehives by the thousands. The beehives and all their parts were made out of cedar wood. Firstly from home grown cedar and then from imported cedar on licence. This in the main kept the business going through the war years. Poultry houses and anything else to do with agriculture was also allowed to be made. Oak, elm, cedar and larch trees were felled in a local wood and a timber carriage was built to carry the wood back to the yard and also doubled to deliver the finished beehives to Exeter. A winch was built on the back of an old Model T Ford van, which Jack obtained from his brother-in-law, to pull the trees out. Freddie Elliot would come up with his steam engine and saw rack bench and cut the trees into planks which were stacked in stick in the yard to dry and season. Eli’s garden was no more; it had become a timber yard. The elm and oak planks were used for coffins; coffins were made to measure at this time. The elm was often not seasoned or very dry but was the best that could be done during the war years. Later on Jack made and constructed a large vertical band saw with a pit in the workshop. Jack also learnt how to sharpen the saws. One unfortunate consequence was that occasionally the large band saw would slip off the pulley wheel and fly across the shop, nobody was ever hurt but it was a near thing. Jack also had an engineering workshop where he would manage to make all sorts of things; this had overhead pulleys and wheels that worked lathes etc. As a model-engineering enthusiast he was making a model steam train. He was also a welder with acetylene torch and could do repairs to broken metalwork often on agriculture machinery. Jack got the idea of making concrete and breeze building blocks. He obtained a hand-tamping machine to make the blocks. River gravel was dug out and loaded onto a six-ton lorry by hand and then unloaded in the same way in the yard, one load took a whole day. That gravel was then hand thrown through a home made rotary screen, the stone that was left went into a stone crusher. It is remembered that the 25hp motor that worked the crusher was fetched with car and trailer from Knotts Quarry at Bampton. Being the only manufacturer of concrete and breezeblocks in the area at that time the demand was good. After a while an agreement was made with Blackhill Quarry to supply washed sand and gravel. The ashes for the breezeblocks were obtained from coal-fired power generating stations at Exeter and Yelland and the paper mill at Silverton and others. At first the ashes were free for clearing but as other manufacturers set up, and they were in demand, the ashes had to be tendered for. A Guy Vixen tipper lorry chassis was purchased and a body constructed, painted up in yellow with the firm’s name, to collect the ashes and also to deliver the finished blocks to the builders. The ashes were stock piled in the yard; a Chaseside mechanical shovel was used to move them. A new building was built to house new block making plant, and also to allow the blocks to be set out in rows on the floor to dry. Jack had 5 children, Ray born in 1931, Betty and Jean each 5 years apart. Bryan born 1943 and Kenneth 1945. When Ray was sent to a commercial college and trained in office work and joined her father about l949. In 1943 a fourteen-year-old boy, Ken Wilson came as an apprentice. In 1953 Ray and Ken married and both continued working with Jack until about 1966. Alice’s mother died in 1951 and the land and property was willed to Alice. The wooden workshop that Eli built needed replacing and Jack built a new larger modern building with the concrete blocks he was making. The machinery had to be reinstalled and rewired. New dust extraction and heating were also installed. The wooden bungalow was also rebuilt, piece by piece whilst the family was still living in it. 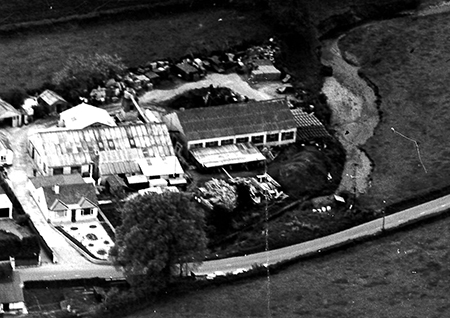 During this time however late 1940’s and early 50’s building work continued, a house was built at Ottery for his father and two sisters and quite a few bungalows were built around Burrow at Newton Poppleford. A pair of houses for his daughter Ray and his two sisters, and a couple in the village, as well as more at Venn Ottery. A second-hand Massey Ferguson digger was purchased and, and with a good driver, found a lot of work on other building sites and this became another facet to the business as it was hired out a great deal. Whilst during the war making the beehives, more joinery machines were obtained. Joinery became the main business, Jack couldn’t resist a machine that could do the work quicker and better and stretched his finances to the limit to get the best machines. This paid off and meant that he could turn out quantities of joinery for all the new buildings that were emerging following the war and during the more affluent times. The business now consisted of several parts, the joinery side, concrete and block manufacturing, building work and contracting out the digger. At the height employing about 40 men as well as office staff, for which a new office was built. An organisation called Rural Industries put Jack in touch with Bernard Leach the now famous potter at St Ives. Bernard Leach wanted a potter’s wheel manufactured to his own design. This was when petrol was still rationed at the end of the war, however petrol was found to make several journeys to St Ives in Cornwall and the design was discussed and Jack would make notes in his usual way on the back of cigarette packets. The kick wheel had to be made heavier or something wasn’t running smoothly enough or the kick piece was too short or the seat wrong. The wheel sold extremely well to schools and colleges as well as to private individuals. It was also exported worldwide. Bernard Leach was very famous and ‘his’ wheel very much sought after. This became just another sideline and continued until a few years after Jack died in 1978. The market for concrete and breezeblock manufacturing became saturated by larger more cost effective makes & production was stopped. The top building where they had once been manufactured was then turned into a joinery assembly shop. 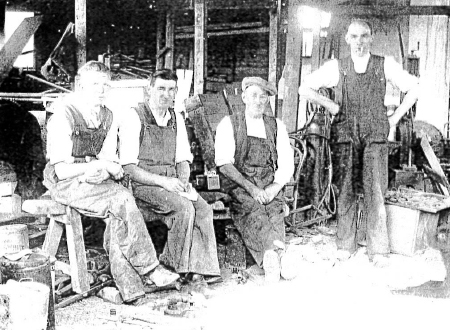 A limited company had been formed with Alice and Jack as directors, and called Woodley’s Joinery Works Ltd as it had then been decided to put all resources into the joinery business. 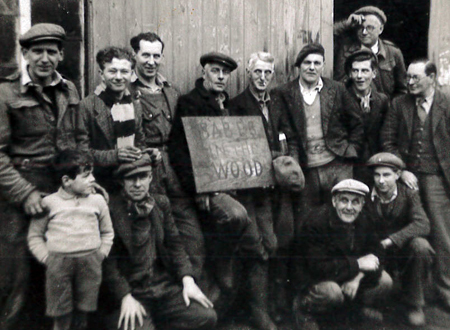 Bryan joined his father Jack in the business in 1958 served an apprenticeship in carpentry & joinery. Then Kenneth the younger son joined and like Jack, as he could understand and repair anything he naturally became involved in all the things to do with machinery; machine installation setting-up and maintenance, tool grinding and sharpening, electrical wiring and all the other many things needed to keep the works going and productive. After Jack died the two sons carried on. The business had its ups and downs, as did the world economy, Kenneth left and went his own way. Alice died in 1981and left Bryan to continue the business on. Production was streamlined into one refurbished workshop containing all the machining & assembly processes, the former assembly workshop was refurbished and let-out as offices and storage. Bryan’s eldest son David joined the company in 1990 as an apprentice carpenter & joiner and continues on with the business to this day as its manager. Bryan’s daughter Sarah has also been involved with the company’s accounts and administration for many years.